In this crazy golden age of comic book movies, there's no shortage of news and rumors landing on fansites and blogs. Some rumors are far-fetched (Joaquin Phoenix as Doctor Strange) or mildly interesting (Spider-Man casting search). We still don't know for sure if Ava Duvernay has the Black Panther directing job (but she should if Marvel has a brain). Two recent rumors - a Green Lantern Corps movie in early development and Ben Affleck set to star and direct a solo Batman film - have us crossing our fingers and toes to see them become a reality. First, Collider provided some profusely prefaced rumors regarding Warner Bros plan to reboot a Green Lantern movie for 2020. After a disappointing 2011 feature that starred Ryan Reynolds, the studio is possibly doubling or even tripling down on a new franchise using more than one human Green Lantern. Hal Jordan may be joined by John Stewart, Guy Gardner, or Kyle Rayner or any combination of all of them. Green Lanterns are an intergalactic police force chosen to wear rings that give them extraordinary powers. Collectively, they are known as the Green Lantern Corps. It sounds like the studio is more interested in creating a movie franchise that reflects the diversity of the Corps than just one Lantern. Jordan's been around since 1959 and is still the best known. Stewart grew in popularity from being the Green Lantern in the DC animated universe in Justice League and Justice League Unlimited. Gardner is a fan-favorite since the '80s. Rayner also had his own fanbase as well. In all fairness, the failed Green Lantern movie wasn't entirely bad. Some of the best scenes took place in space when Reynolds as Jordan was training with Sinestro and Kilowog. There just wasn't enough of those scenes. The Corps as an interstellar law enforcement agency has way more potential than one more guy in spandex flying around a metropolis. Another rumor has Chris Pine up for the role of Jordan which sounds a lot better than the rumor of him portraying Steve Trevor. 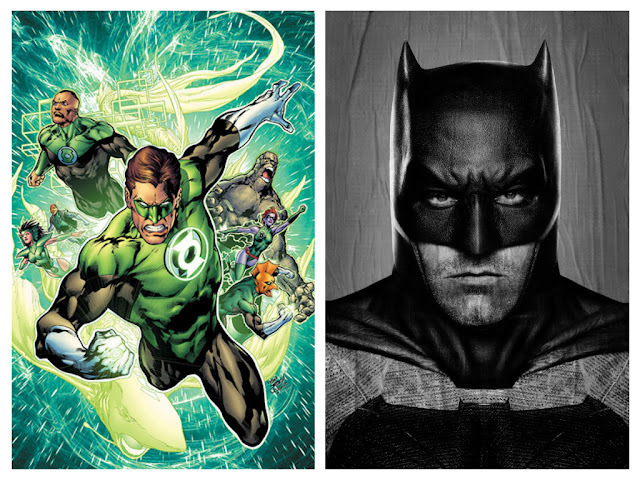 The question is which Lantern will be represented in the Justice League movies? Or which one will win a cameo in Batman V Superman if at all? It could be one or two. Whatever the number we're just hoping to see them all in a Green Lantern Corps movie. When Ben Affleck was cast as Batman in Batman V Superman: Dawn of Justice besides the typical knee-jerk reaction from fanboys it was speculated that he'd have more creative input. The fact that he brought in screenwriter Chris Terrio, of his acclaimed movie Argo, to clean up the David Goyer script showed he had some pull at Warner Bros. Then Terrio was chosen to script Justice League Part 1 and Part 2. Now Latino Review reiterated an earlier report of theirs adding that Terrio would be writing, Affleck starring and directing 'The Batman' for November 2018. It'll be going up against Captain Marvel the same month. This is one rumor we can get behind. Affleck has done some incredible work as of late so we're confident he'll do the Dark Knight justice. Of course, some of that hinges on his performance in Batman V Superman. If rumors hold out to be accurate 2018 will be an amazing year in comic book movies. The Flash, Aquaman, an unnamed X-Men movie, Black Panther, Captain Marvel and Avengers Infinity War Part 1 are already on the schedule. Will there be room for 'The Batman'? Batman Batman v Superman Dawn of Justice Ben Affleck casting Chris Pine Green Lantern Green Lantern Corps Justice League movie Warner Bros.
Labels: Batman Batman v Superman Dawn of Justice Ben Affleck casting Chris Pine Green Lantern Green Lantern Corps Justice League movie Warner Bros.